Good morning crafters, Julie here, I hope you are well today? 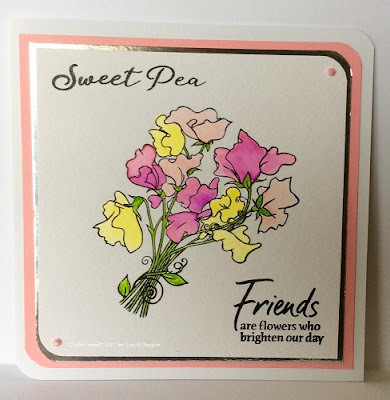 Today I've got a quick make for you using the lovely Hobby Art Sweet Peas stamp set. These make me feel Spring has definitely arrived and with the crocuses and daffodils out, it's great to start to see more colour when I'm out and about. Back to my card...first I stamped my sweet peas, the sweet pea text and a greeting from the Hobby Art Sunny Day Greetings set, as the wording went so well with the bunch of sweet peas. 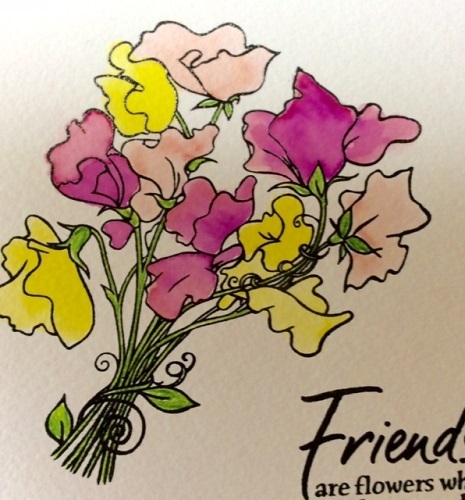 I then set about colouring my sweet peas in using Spectrum Aqua Markers from the Floral set, (reduced to £10 on the website!) adding a little colour and moving it around on the watercolour card with a wet paint brush. These markers are great fun as you can add but also take away colour and if a bit goes over the edge of the line you just add a little water and remove with some paper towel. I then rounded 2 opposite corners and used a silver Mirri mat (also rounding 2 opposite corners) and did the same to a piece of pink card from my stash, before layering together and mounting onto my finished card blank. To finish I added 2 pale pink pearls one to each rounded corner and the card is complete. I seem to be in a clean and simple phase at present and this is a very quick and easy card for when you haven't got a lot of time. Thank you for visiting the Lisa B Designs' blog today, see you next week.